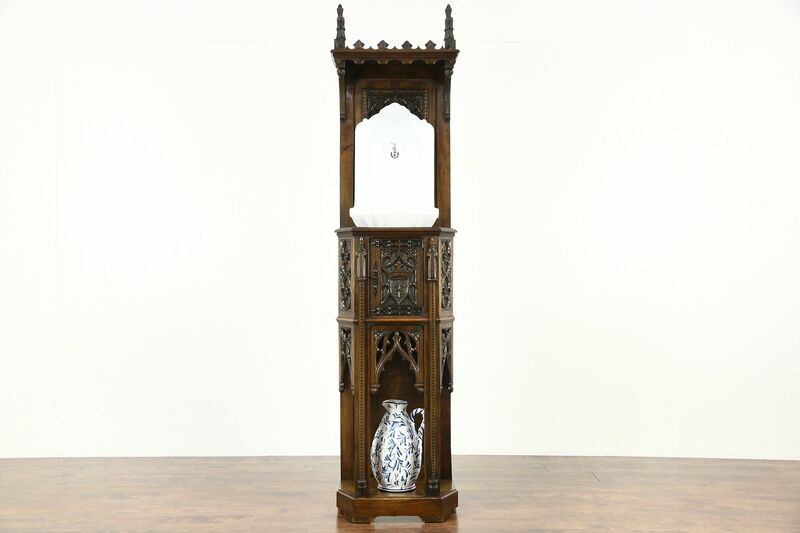 A Gothic carved cabinet was wonderfully hand carved in France about 1880, and was fitted with a porcelain fountain or lavabo sink as a prop for the "Exorcist' TV show. Solid walnut with exquisite detail and a family coat of arms, the hand carved figures and tracery are exquisite. The original finish is very well preserved on this antique furniture. Waxed and buffed, all that is needed to maintain the warm patina is an occasional wipe with a soft dry cloth. Wrought iron hardware and the working lock are original. For filming the TV show, holes were cut to fit the new fluted fountain or lavabo sink and faucet. The spigot and drain could be connected to plumbing if desired. Measurements are 23" wide, 14" deep and 7' 7" tall.